Azure HDInsight is a fully-managed cloud service that makes it easy, fast, and cost-effective to process massive amounts of data. Use the most popular open-source frameworks such as Hadoop, Spark, Hive, LLAP, Kafka, Storm, R & more. Azure HDInsight enables a broad range of scenarios such as ETL, Data Warehousing, Machine Learning, and IoT. To meet these requirements, the HDInsight team went with a preview of the HDInsight premium cluster tier for Hadoop cluster types. We received a tremendous response, and a lot of customers signed up to be part of the preview program. Based on the feedback, and customer interest, it became clear that this feature shouldn’t be part of different cluster tier but rather an add-on to the regular/standard HDInsight cluster. Creating the add-on the security package simplifies the cluster creation workflow and improves user experience. Today, we are excited to announce that these features are available as part of the add-on (optional) Enterprise Security Package. As part of provisioning the HDInsight cluster, you can optionally select the Enterprise Security Package. 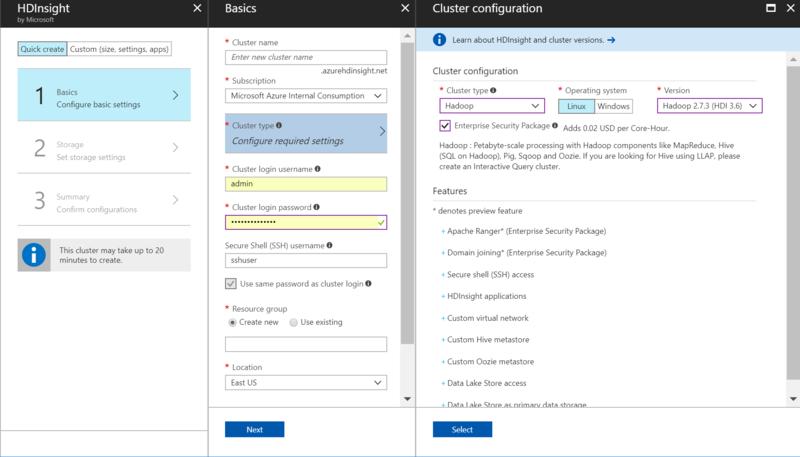 Integrate the HDInsight cluster with Azure Active Directory Domain Services. As an admin, you can grant domain users access to the cluster This means, that users can use their own corporate (domain) user-name and password to access the cluster. Configure Role-Based Access Control for Hive, Spark, and Interactive Hive tables using Apache Ranger. Additionally, you can also set file and folder permissions for data stored in Azure Data Lake Store. View the audit logs to see who accessed what data and what policy was enforced as part of the access. We have enabled this feature for Hadoop, Spark, and Interactive Query cluster types.